Topics: Bout Us, Faq's, Free Form Swimming Pools, Geometric Swimming Pools, Raised Beams Swimming Pools, and Grottos & Waterfalls. It is hosted by Hostdime.com Inc (Florida, Orlando,) using Apache/2 web server. It has 2 DNS records, ns2.myhostservers.net, and ns1.myhostservers.net. 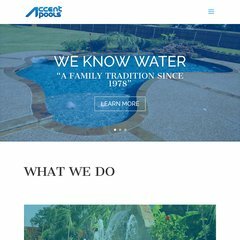 Accentpoolsinc.net's server IP number is 72.29.83.40. PING www. (72.29.83.40) 56(84) bytes of data. A time of 85.0 ms, is recorded in a ping test.